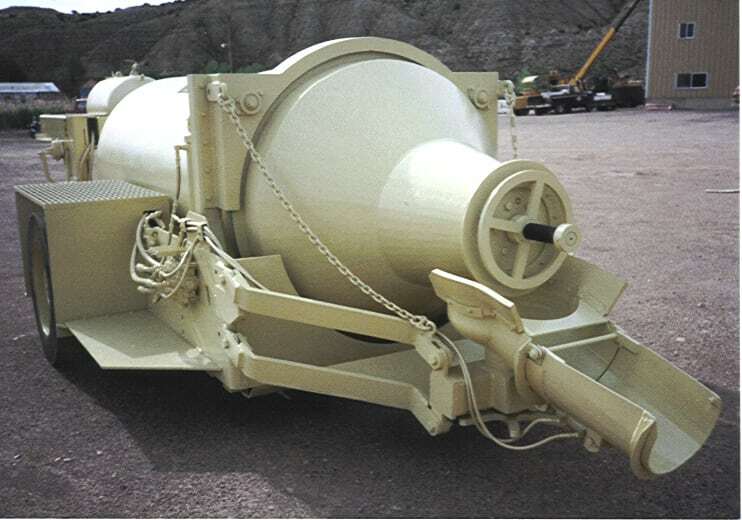 We designed and built our first concrete trailer for underground mining in the early 90's, though we built "Moran" concrete cars on rail wheels for the tunneling industry in the early 80's. And we have built several variations on the theme since that time. Uintah Machine manufactures a line of low-profile custom concrete trailers built to order. We offer a variety of heights, capacities, and hitches. Our concrete mixer trailers can be built integrally with tractors, and with pintle or gooseneck hitches. We offer hydraulically tilting drum to increase the discharge height. The drum is turned by a hydraulic motor in the front and supported by rollers on the top and bottom in the rear. Landing legs can be hydraulic or manual. We also offer optional discharge chutes. We take pride in our work. You can count on receiving the toughest, highest-quality, lowest-maintenance concrete trailer available. Uintah is happy to design and build a concrete trailer to meet your specific needs. Call us at 435-738-2453 with your requirements.